EcoFlight, a nonprofit organization based in Aspen, Colo., provided air transportation for the tour. 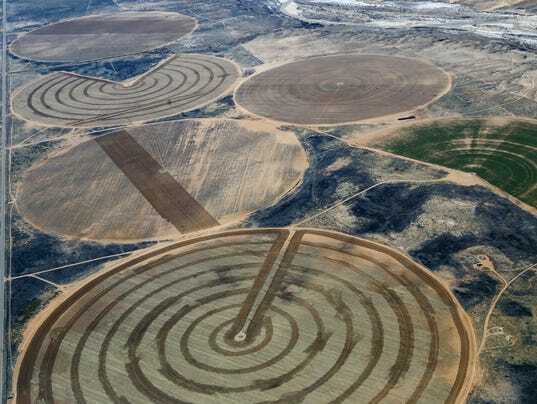 Tribal officials flew over tribal land southeast of Farmington and in southeast Utah. An industry spokesman says the new regulations will result in the closure of many local gas wells. FARMINGTON — Environmental advocates gave officials from chapters in the Northern Agency an elevated view of natural gas and oil production on the Navajo Nation on Monday. The flight was conducted in response to growing pressure to repeal a new federal rule meant to reduce methane emissions and to show leaders the environmental impact of such production. In November, the Bureau of Land Management issued new regulations for methane emissions for flaring, leaking and venting from oil and natural gas production on public and tribal lands. Efforts are underway to repeal the rule, including a joint resolution introduced in January by U.S. Sen. John Barrasso, R-Wyo. The resolution has been referred to the Senate Committee on Energy and Natural Resources, which has yet to address the proposal. For Laurie Weahkee and Sam Dee, now is the time to generate support for keeping the rule in place, as well as advocating for the Navajo Nation to develop a similar rule under its own EPA. Weahkee is the executive director for the Native American Voter Alliance, and Dee is an independent consultant with 40 years of experience in the oil and natural gas industry. One of the reasons the flight was scheduled, Dee said, was to help broaden the perspectives of chapter officials about drilling activities. "We have some issues with methane because it is affecting the environment, health," Dee said. Flying over tribal land southeast of Farmington, tribal leaders saw numerous production sites dot the landscape and nestle in the ridges of the plateau. 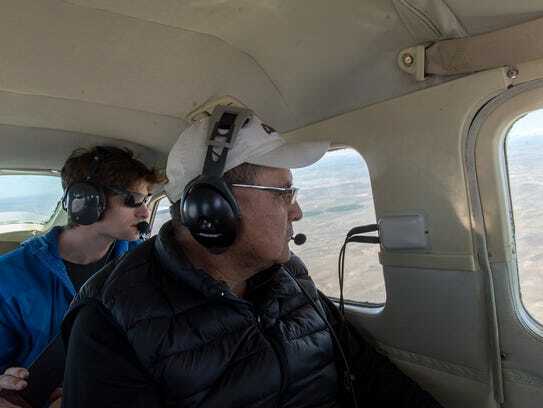 Shiprock Chapter President Duane "Chili" Yazzie said the flight showed him that "every nook and cranny" had roads, tanks and pump jacks, and that activity increased his concern about the environmental impact of oil and gas activity. "My thought was it is an over proliferation of development. The only conclusion I can make out of that is, it's greed. Industry is not satisfied with what it is getting out," Yazzie said. 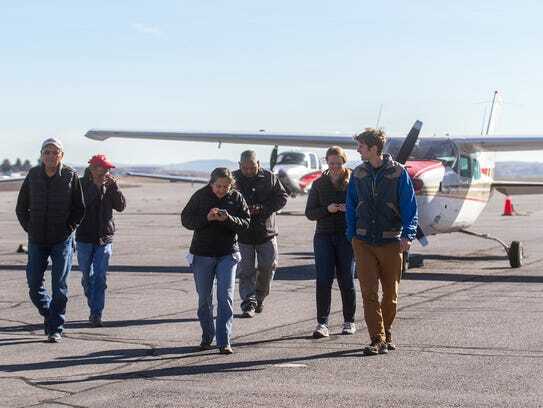 Aneth Chapter President Wesley Jones and Navajo Nation Council Delegate Davis Filfred were part of the flight that traveled into southeast Utah. Jones said natural gas and oil production have caused pollution, and that activity is causing vegetation to deteriorate. There are Navajo elders who use plants for medicinal purposes, and certain plants are becoming scarce, he said. Weahkee and Dee were part of a group from the Navajo Nation who traveled to Washington, D.C., in early February to meet with federal lawmakers about the need to keep the regulation in place. "I think it was important for them to hear from affected Navajo people and communities. … Our hope is that they'll recognize that this is a very pragmatic and practical rule that they should not overturn," Weahkee said. Under the regulations, oil and gas producers will be responsible for updating equipment, using current technology to reduce flaring and conducting periodic inspections to check for leaks. Wally Drangmeister, spokesman for the New Mexico Oil and Gas Association, said there are thousands of low-producing gas wells in the San Juan Basin, and those wells will become uneconomical to maintain as costly regulations are added. "Once wells become uneconomical to operate because of increased costs forced by these regulations, they are permanently closed, and the well sites are restored (to a natural state)," Drangmeister said adding job loss will increase if wells close. He added that a calculation by the New Mexico Tax Research Institute projects the rule will cost the state approximately $105.1 million over the next three years. "For decades, environmental groups have consistently accused the oil and gas industry of being greedy and motivated solely by profits, but now they claim the oil and gas industry is purposefully wasting natural gas that is costing the state of New Mexico millions in royalties," Drangmeister said.